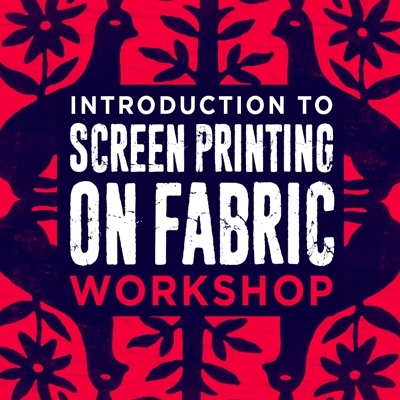 Instructors Jen Hewett and Marsha Shaw will teach you the basics of emulsion-based screen printing on fabric, including: creating film, coating and exposing screens, registering and printing two-color prints, and heat setting fabric. The class fee includes all the tools necessary to create film and to print. Students are expected to come to class with a project and two-color design (no larger than 8.5×11”) in mind, and to bring their own fabric or items to print on. Detailed information about number and types of items to consider printing, as well as required pre-work will be sent upon registration. Students who already have the skills to digitally create two-color separations are welcome to submit their files for output prior to the class. Please note, however, that this class is an introductory one, and we will not be covering printing repeat patterns on yardage during the course of this class. Jen Hewett is a printmaker, surface designer, textile artist and teacher. A lifelong Californian, Jen combines her love of loud prints and saturated colors with the textures and light of the California landscapes to create highly-tactile, visually- layered, printed textiles. She regularly teaches block printing on fabric, both around the country and online. Her book, Print, Pattern, Sew: Block Printing Basics + Simple Sewing Projects for an Inspired Wardrobe, was published by Roost Books in May 2018. Marsha Shaw is a printmaker and book artist living in San Francisco. She received an MFA in Printmaking from California College of the Arts in San Francisco and a B.A. in Art and M.A. in Painting from California State University Northridge. Shaw is currently an adjunct faculty member at De Anza College in Cupertino where she teaches drawing and design. She is the coordinator of Mission Grafica, a print studio at the Mission Cultural Center for Latino Arts, where she teaches printmaking workshops. She has lectured and taught courses in bookmaking and printmaking at California College of the Arts, San Francisco Center for the Book, Richmond Art Center, Museum of Children Art and Mendocino Art Center. Shaw’s work is in several collections and has been exhibited both nationally and internationally.